As Japan was suing for peace and World War 2 was coming to an end, on August 6, the U.S. dropped the first atomic bomb ever used, on Hiroshima. Between 140,000 and 150,000 people, overwhelmingly civilians, died from the attack and hundreds of thousands were wounded. 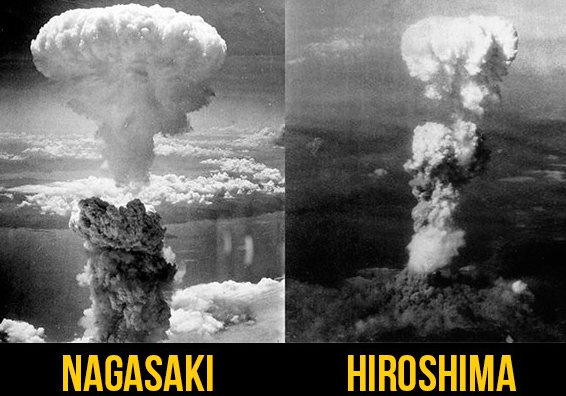 On August 9, the U.S. dropped an even more powerful nuclear bomb on Nagasaki, murdering another 70,000 people. The U.S. armed, trained, and led the reactionary Greek military in a bloody counterinsurgency against anti-fascist guerrilla fighters who had driven Nazis from many parts of Greece during WW 2. The leftist fighters suffered losses of many tens of thousands before their surrender in October 1949. In June 1950, the U.S. orchestrated a United Nations invasion of Korea, and sent over 340,000 American troops. U.S. and U.S.-led forces killed more than two million North Korean civilians, 500,000 North Korean soldiers, and between 900,000 and a million Chinese soldiers. 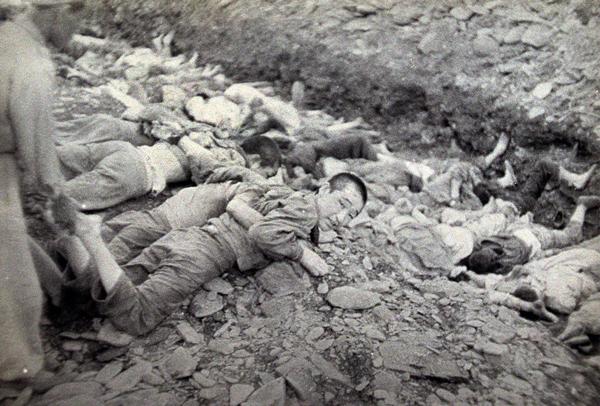 There were also 1.3 million South Korean casualties, including 400,000 dead. The CIA and British intelligence launched a military coup overthrowing Iran’s elected prime minister, Mohammad Mossadegh, who had nationalized Britain’s Anglo-Iranian Oil Company, replacing him with U.S. puppet Mohammad Reza Shah Pahlavi. The coup embedded Iran as a key military outpost for the U.S. against regional liberation struggles and in its Cold War clash with the Soviet Union. The Shah ruled as an iron-fisted U.S. puppet for 25 years. The U.S. sent more than 500,000 troops and dropped millions of tons of bombs in an effort to defeat the national liberation struggle of the Vietnamese people. 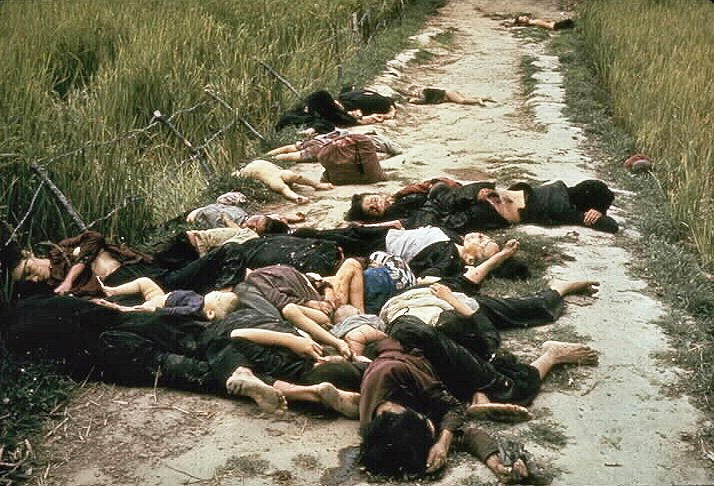 By the time the war ended in America’s defeat in 1975, its military had slaughtered some two million Vietnamese civilians and one million Vietnamese soldiers. 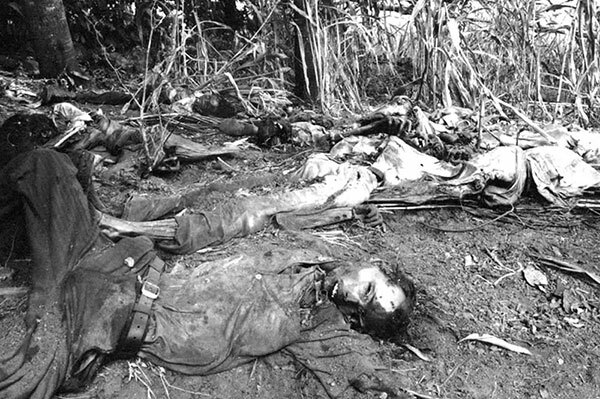 During the war, the U.S. also bombed the small neighboring countries of Laos and Cambodia, killing hundreds of thousands. On January 17, 1961, a firing squad shot to death the Congolese anti-colonialist leader Patrice Lumumba, months after he’d been elected prime minister of the newly founded Republic of the Congo. This murder was carried out by Lumumba’s Congolese enemies, but it had been called for by President Eisenhower and organized by CIA Director Allen Dulles. Murdering Lumumba and then in 1965 installing the brutal regime of Mobutu Sese Seko turned Congo (Zaire) into a bulwark for U.S. intervention in Africa for nearly three decades. While global imperialism and Mobutu plundered the country, Congolese people suffered hellish enslavement and destitution. On April 28, 22,000 U.S. troops invaded the Dominican Republic to crush a just, mass uprising against the country’s pro-U.S. tyranny. Thousands of Dominicans were killed. In 1965, the reactionary Indonesian military, led by the pro-U.S. General Suharto, as well as other reactionary forces that it unleashed, slaughtered people with wild abandon. This was set in motion, backed, and orchestrated by the U.S., which provided the military with equipment, weapons, and ultimately tens of billions of dollars. When the bloodletting ended, at least 500,000, perhaps more than a million, had been killed, including members of the Communist Party of Indonesia, trade unionists, intellectuals, teachers, land reform advocates, ordinary peasants, ethnic Chinese, women, and children. On September 11, 1973, the Chilean military, with secret backing from the U.S., carried out a coup against the leftist government of President Salvador Allende. More than 3,000 Chilean people were executed, thousands more were “disappeared,” and tens of thousands tortured; over 140,000 people were rounded up during the coup, and in the few years that followed, as many as one million people out of Chile’s population of 11 million were forced into exile. In 1975, when Portugal ended its colonial rule over Angola, and the MPLA, one of the groups that fought for independence, was set to take power, the U.S. began arming, funding, and militarily assisting the reactionary anti-MPLA butchers of UNITA headed by Jonas Savimbi. A savage civil war was unleashed which lasted until 2002. Some 500,000 were killed, over four million were driven from their homes. In 1975, President Ford and Secretary of State Kissinger met with Indonesian dictator Suharto and green-lighted Indonesia’s invasion of its neighbor, East Timor. Up to one-third of the Timorese population, as many as 20,000 people, were killed through massacres and enforced starvation. Many Timorese were imprisoned and tortured by a military armed and trained by the U.S. The slaughter continued for almost 25 years. To crush a guerrilla struggle against its brutal client regime, the U.S. supported, funded, and armed death squads that carried out extra-judicial executions and massacres which killed as many as 75,000 Salvadorans. After the Sandinistas overthrew the pro-U.S. Somoza dictatorship in 1978, and established friendly ties with the Soviet Union, the U.S. worked to overthrow them through its proxy army, the Contras, formed from Somoza’s vicious National Guardsmen and other supporters. As many as 50,000 people were killed. In 1982, the U.S. backed a military coup by the Christian fascist General JosО EfraТn RТos Montt, who then launched a genocidal assault on Guatemala’s indigenous Mayan population. Guatemala’s military systematically destroyed more than 600 indigenous Mayan villages, slaughtering some 75,000 people. The Guatemalan military regime’s savage, U.S.-supported war continued until 1996. It’s estimated that some 200,000 people were disappeared or killed. From January 16 to February 27, 1991, the U.S. waged war against Iraq to strengthen its grip on the Persian Gulf. Some 100,000 Iraqi soldiers were killed and another 300,000 wounded. The war also caused the deaths of 70,000 civilians by January 1992. By 1997, the UN reported that more than 1.2 million Iraqis had died as a result of medical shortages caused by the war and sanctions, including 750,000 children under the age of five. In 2001, U.S. forces invaded Afghanistan, drove the Islamic fundamentalist Taliban regime from power, and installed a widely hated, pro-U.S. “Islamic Republic.” The U.S. air and ground war has continued ever since. 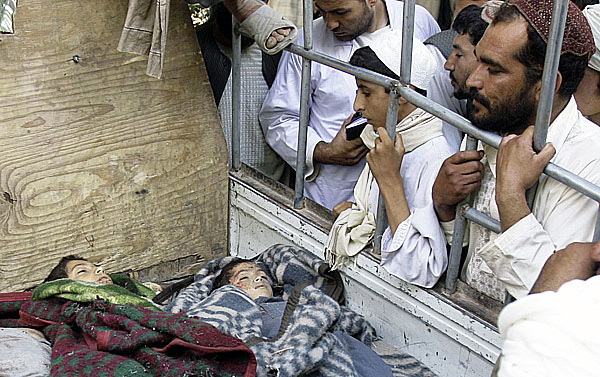 By August 2016, some 111,000 (including more than 31,000 Afghan civilians) had been killed and over 116,000 injured. In 2003, the U.S. invaded Iraq and overthrew Saddam Hussein’s regime based on the lie that Iraq possessed weapons of mass destruction. The U.S. war and occupation sparked armed resistance and led to the rise of reactionary Islamic jihadism and the ethnic-sectarian conflict that continues to this day. Some studies estimate that between 1.2 and 1.4 million (and perhaps as many as 2.4 million) people in Iraq have died from the war’s direct and indirect impacts. More than 4.2 million Iraqis had been injured and at least 4.5 million driven from their homes by 2016. In March 2011, the U.S., Britain, and France seized on a mass uprising against Muammar al-Qaddafi’s oppressive 42-year-long rule to launch a war. For the next seven months, the U.S.-led coalition carried out extensive bombing raids and military operations. 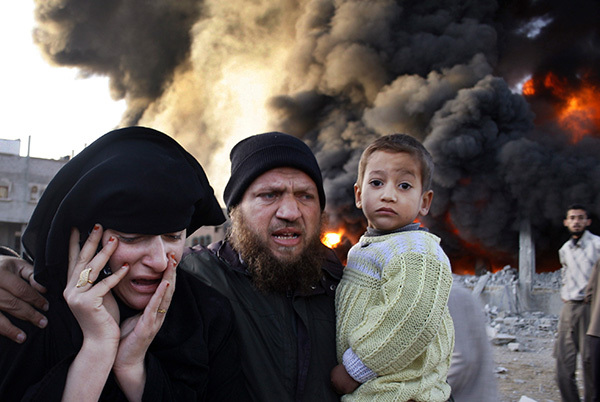 By October, between 10,000 and 30,000 had been killed and Qaddafi’s regime had been shattered. Libya was turned into a battleground between reactionaries, and life became a nightmare for the people, with shortages of food, water, and electricity. In March 2015, Saudi Arabia, with U.S. backing, launched a war against Yemen’s Houthi movement. Since then, between 57,000 and 60,000 have been killed. The Saudis have bombed Yemen’s food, water, and medical systems, causing massive hunger and disease. At least 85,000 children have starved to death as a result, and in 2016 and 2017 alone, 113,000 children died of starvation or preventable disease. Fourteen million Yemenis are on the brink of famine. The U.S. supported the foundation of Israel, which was created by defeating armies from Egypt, Jordan, Syria, and Iraq in war, and by violently forcing at least 750,000 Palestinians from their lands and homes. Zionist forces took more than 78 percent of historic Palestine, ethnically cleansed and destroyed about 530 villages and cities, and killed about 15,000 Palestinians in a series of mass atrocities. This is known as the Nakba (Arabic for catastrophe). Since then Israel has launched a series of aggressive wars in the region. Israel, backed with billions of dollars of U.S. aid annually, has increasingly functioned as a key U.S. proxy and attack dog. As the Get Organized for an ACTUAL Revolution Tour hits the road, get the new four-page print issue of Revolution way out there and into the hands of many, many people across the country! As the slogan says, the Republican Party is fascist, and the Democratic Party is also a party of war crimes and crimes against humanity—and this paper gives undeniable, incontrovertible proof of that! Anyone who wants to uphold any of them, no matter what their vows and promises, is going along the road of complicity with real crimes against humanity. 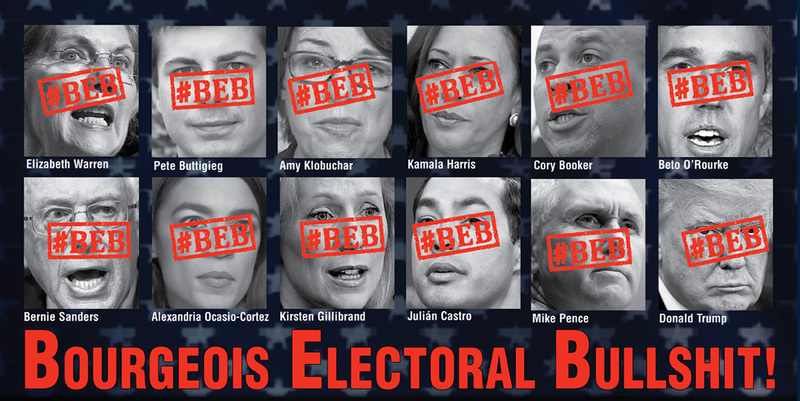 This system cannot be reformed—we need an ACTUAL revolution! Get people to take 10, 20 or more copies of the broadsheet to distribute as part of spreading the movement for revolution—and write to revcom.us at revolution.reports@yahoo.com about getting them out (contact RCP Publication at rcppubs@hotmail.com for order information). Call on people to support and hook up with the Get Organized for an ACTUAL Revolution Tour and to follow the Tour at www.revcom.us and on via @tuneintorevcom on social media. A regime that could destroy civilization. You think you know… but you don't. “...we have two choices: either, live with all this—and condemn future generations to the same, or worse, if they have a future at all— or, make revolution! Be part of the network spreading revolution across the country. Distribute this broadsheet and write about your experience to revolution.reports@yahoo.com.